Getting to be a Smart City first requires getting connected. A Connected City is a city or community that has the network infrastructure (fiber optics, wi fi, small cell, towers) that allows for the efficient exchange and collection of information (voice, data, video) via a variety of devices both public and private (sensors, cameras, phones, traffic signals). Street furniture such as light poles, bus shelters, kiosks, waste containers and other street level infrastructure is ideal for deployment of next generation (5G) telecommunications gear. The goal is to get the antennas closer to the user. Smart Cities encourage the growth of telecom infrastructure by creating both a policy and investment environment that facilitates growth. There are a limited number of stakeholders in each city and community that have developed networks. Stakeholders that usually control the majority of network assets in a city or community include: Utilities, Cableco’s, Cellular Carriers, CLEC’s and Telephone Companies, Transportation Authorities and Public Safety Departments. The city generally plays 3 roles in developing a Connected City since much of the investment will be borne by the Private Sector. Many Cities struggle to ensure broadband access to all consumers. Digital Inclusion initiatives involve everything from multi-stakeholder PPP’s to the National Internet Essentials program provided by Comcast. Reaching rural communities continues to be difficult. Telecommunications is a core pillar of Smart City Infrastructure and requires an ecosystem of public private cooperation to maximize its impact. Cities that actively engage in creating a Connectivity friendly environment and develop a Broadband Strategy deliver significant benefits to its citizens. 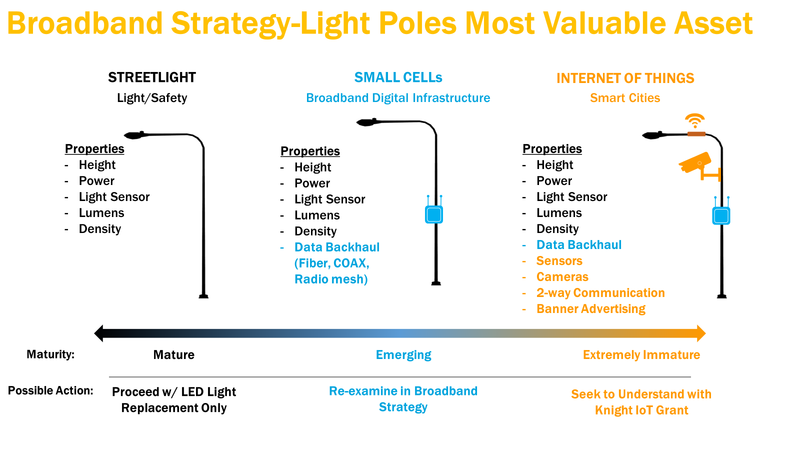 Aligning with the utilities that often own most of the pole infrastructure is a key step. It is no longer necessary to convince Cities that Connectivity is vital. The challenge is in funding and executing. Network construction is capital intensive and requires an operating budget each year. Maintaining networks requires specialized equipment and skill sets most cities are not budgeted to support. The collaborative approach has proven to be successful. Policy models exist that have been driving investment and growth. 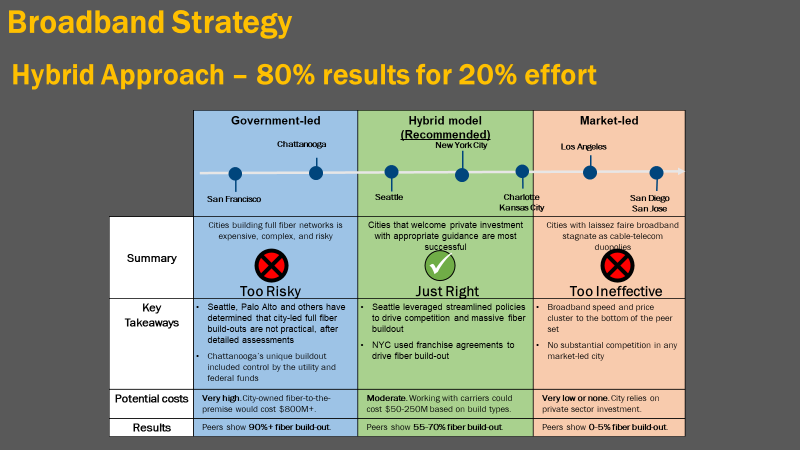 The City of San Jose, California recently provided this look at their Broadband Strategy for a Smart Cities Council event in Silicon Valley. They looked at how to ensure broadband connectivity was ubiquitous and affordable. Their model projects the benefits of collaboration between the public and private sectors. San Jose started to put their plan into action in early 2018. As part of the plan, they took an aggressive stance with the 2 largest wireless carriers, AT&T and Verizon. They understood the importance to the carriers of timely deployments on City or Utility owned infrastructure. San Jose successfully negotiated customized agreements with each carrier that ensures dense network technology would be deployed in San Jose to service the main business districts and residential areas. They also were successful at getting the carriers to create a set aside fund to enable the city to provide network services to underserved markets of the city to create digital equity. The City looked at its pole infrastructure and determined there were going to be 3 primary uses. 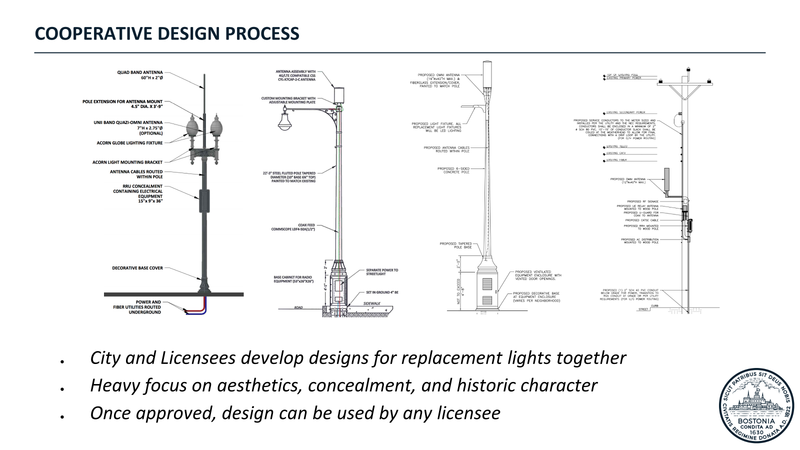 The first use was as a traditional streetlight that would be upgraded to LED to meet sustainability goals. Second, the poles are critical to the broadband infrastructure needed to build out 4G and 5G. Third, poles are now being used to mount more and more things such as cameras, sensors and advertising. Connecting these things is called the Internet of Things. First, the increased broadband collaboration lead to new capability. San Jose developed a Demonstration Partnership Policy, which was established to support its Economic Development Strategy and city operations. Under this policy, a SmartPole pilot project is being deployed. San Jose is working with Philips Lighting and local utility, PG&E to deploy 50 SmartPoles, with energy-efficient, wireless-controlled LED lighting. The city estimates that the LEDs will provide the city with a 50-percent energy savings compared to conventional streetlights. Second, The SmartPole also offers built-in 4G LTE small cells. This enhanced coverage serves both the citizens of San Jose as well as provides capacity for IoT applications that the city may choose to implement. Philips also collaborated with PG&E to design a two-way communicating meter that sits on top of the SmartPole, rather than requiring the typical pedestal meter on the ground, thereby reducing street clutter. Other cities have been collaborating with Utilities and Pole Manufacturers. 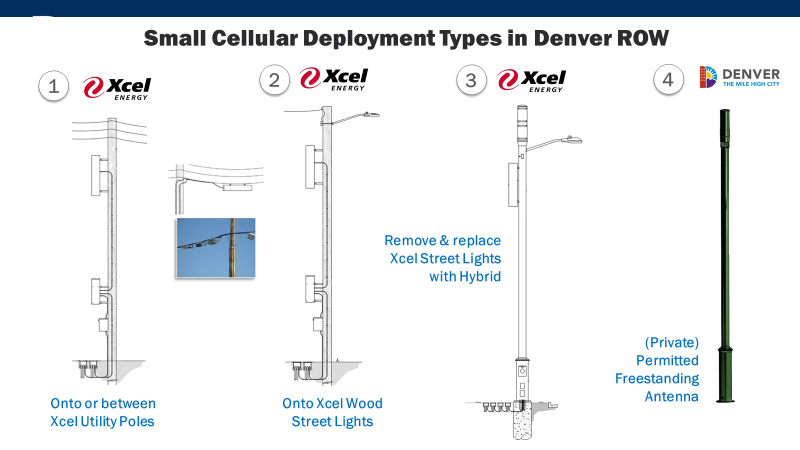 The City and County of Denver recently released this guide to deal with small cells and pole attachments.